Apoptosis, or programmed cell death, is an important cellular mechanism that is critical in development and tissue homeostasis. Apoptosis also plays a role in cancer biology. For example, visualizing apoptosis in response to treatments is one way to characterize potential therapies. While 3D cell cultures are ideal for mimicking a tumor microenvironment, obtaining apoptosis data after treating the cultures can prove difficult. To overcome this difficulty and to make apoptosis data accessible to researchers using Cell-Mate3D™ matrix, we optimized the commonly used Invitrogen™ CellEvent™ Caspase-3/7 Green Detection Reagent that enables quick and reliable imaging of apoptotic cells in culture. AU565 human breast cancer cells (HER2-positive) were embedded into the Cell-Mate3D™ matrix. One sample was left untreated and an equivalent sample was treated with 100 μM Taxol for 12 days. Samples were stained with 15 μM CellEvent™ Caspase-3/7 reagent (three times the recommended concentration). Green-fluorescent apoptotic cells were clearly seen in the Taxol-treated sample by inverted confocal microscopy. 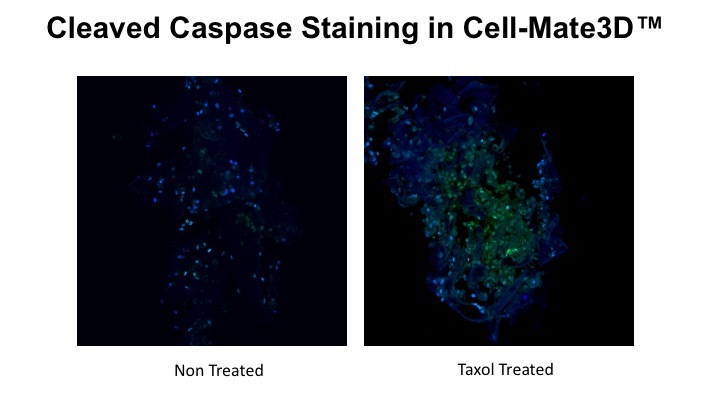 Caspase staining appears brighter in Taxol treated cultures compared to non-Taxol treated cultures. Figure 1. Detection of apoptotic cells in the Cell-Mate3D™ matrix using CellEvent™ Caspase-3/7 Green reagent. AU565 breast cancer cells were embedded in the Cell-Mate3D™ matrix and cultured for 12 days. Cells were untreated (LEFT) or treated (RIGHT) with 100 μM Taxol for 12 days to induce apoptosis. Cells were then incubated with the Invitrogen™ CellEvent™ Caspase-3/7 Green Detection Reagent (15 μM) for 30 min. to label apoptotic cells with green fluorescence, counterstained with the Invitrogen™ NucBlue™ Live ReadyProbe™ Reagent, and imaged using an inverted confocal microscope at 20x magnification.